Face it. We’re all inundated with email. Somewhere, amidst the Amazon offers, Dominos/Pizza Hut email, Alumni pleas, Event Invitations…and so on, and so on…are actually some “real” emails that require your attention! There are a bunch of ways to deal with moving unimportant emails ‘out of the way’ to review later (setup “rules”, people! ), but I just found out about a way to HIGHLIGHT those emails that you really CARE about! Imagine my glee when I found out that this is actually a choice in Microsoft Office. I’ve used Outlook for YEARS and never knew! We have all heard that “ransomware” is on the rise and that no one is immune. It’s true and it’s scary. Ransomware and viruses can be spread easily through PDF files and ‘evil’ links. Just like an offer that’s ‘too good to be true’, an email that appears to come from someone you know (whether you know them well, or only vaguely), which is ‘odd’ or ‘suspicious’, probably is. S-T-O-P. DO NOT OPEN IT. Open up a new email, write that person in that ‘clean’ email, and say something like, “Hey – I got an odd email from you with an attachment. Did you send it to me? If not, you may want to email your contacts and let them know that your email was spoofed, and NOT to open that email if they got it”. Delete the initial email. Move on with life. We can’t avoid malware and ransomware, but I have always wondered WHO and HOW it spreads so quickly. Enter a wonderful video from Cisco (they make major network equipment that allows all of us to communicate so quickly and easily through computers). Please find four minutes to watch this – it is entertaining – and horrifying. It’s well worth the time to watch these videos in order to better understand how your behavior can actually open you up to attacks. Understanding is the first step in being able to avoid being attacked. What are browser Add-Ins (Add-Ons), Extensions and Plug-Ins and why do I care? It seems like every time you start to get on top of technology ‘lingo’, another term comes out. On top of that, depending on if you are a Google/Chromebook, Apple or Microsoft user, similar terms are given different names, so that you can’t tell that they’re really the same thing. Enter the world of web browser add-ins, aka add-ons, aka extensions, aka plug-ins. There are four main browsers (you know, the program or window that you open to get to the web) – Google’s Chrome, Apple’s Safari, Microsoft’s Internet Explorer and Mozilla’s Firefox. Most people have a favorite – whether it’s a favorite because they just accept the default browser on a new device, or because they specifically install a particular browser. Regardless of why you use one browser over another, you can probably improve the way your browser behaves by installing one (or more) tiny programs called add-ins (or add-ons or extensions or plug-ins). These little programs make a browser “smarter” and allow you to do more with the browser than you could before the add-in/add-on/extension/plug-in was installed. For example, concerned about “them” knowing who you are and where you go on the web? Consider installing an extension that protects your privacy. Struggle with the ever-growing list of passwords? Install an add-on that manages your passwords. How about one that will pin a page to Pinterest for you instantly. Use Evernote? Install an add-on that will allow you to save a web page to Evernote with one click. Want to find coupon codes as you’re shopping (even on Amazon)? There’s an add-on for that. Do you want to more easily download videos you see online to your computer? Grab an add-on. The list goes on and on and on. These add-ins (add-ons), extensions and plug-ins take your fuddy-duddy old browser and make it work for YOU, the way YOU want it to! What a concept! Once installed, an add-in may add a new toolbar, or a new icon on the toolbar, or just change the behavior of your browser in some way or another. The behavior is usually described in a blurb before you actually install it. Each browser has a different portfolio of these tiny programs available for use (though Internet Explorer probably has the fewest). They are updated all the time. If you’re trying to do something in a browser, check out the add-ins. Annoyed by a particular behavior of a browser (e.g. do you always get a message about cookies being installed on this site or that site)? Find an extension that blocks or changes that behavior. Without going into a ton of details, I’ll begin by saying that any day which includes the words ‘Well, after the firemen left my house…’ probably isn’t the best of days. Actually, it was a VERY GOOD day…my house did NOT burn down…but it could have…and it all started with a power strip. After I had FOUR different experts (Fireman, Fire Inspector, PECO Lineman and Electrician) tell me – independently – that they’ve seen more house and office fires caused by power strips which really are NOT “real” surge suppressors, I vowed to replace ALL of them with the appropriate devices. You see, people use these power strips as extension cords, but these same non-surge suppressing power strips are VERY VULNERABLE to fire. If this particular power strip had NOT been sitting on tile, this story would have had a horrid ending. As it is, it’s just an expensive and inconvenient lesson. When you are buying a surge suppressor/power strip, the ones that cost in the $10.00 and under neighborhood should be avoided. Spend $20.00 (or more, depending on how expensive the item you’re plugging into it), and REALLY protect your home and office. EVERY “PROPER” SURGE SUPPRESSOR in my house ‘blew up’ that day, but the ONLY ONE that caught fire was the non-rated one. The “proper” surge suppressors all fell on their proverbial swords, and ‘took the hit’, blocking the massive power surge that caused the inexpensive power strip to catch on fire, “killing” themselves, but saving the devices that were plugged into them. I am NOT endorsing any particular brand, but the well-rated brands have this type of information on the box. So, I got quite an education last week on power strips and surge suppressors. When purchasing anything to ‘extend’ your outlets (i.e. to get more outlets off of one outlet), or when trying to protect devices, spend the extra money and get one which is ‘rated’ and guaranteed to ‘take the hit’. The surge suppressor itself might be killed, but odds are that the devices plugged into it will be protected. EVEN MORE IMPORTANT…they’ll protect your home/office from fire. I know…I’ve been AWOL. It’s just been very busy. Not bad, just busy. Unfortunately, there’s a new threat to your computer and your data that is emerging (and growing rapidly) that compels me to actually ACT on writing a blog post, rather than just THINKING about it! You may have heard the term ‘Ransomware’ on the news lately. This is serious business, and anyone, using any type of device can be vulnerable. Avoiding it isn’t as hard as you think, but you do need to PAY ATTENTION! First, what is ‘Ransomware’. Ransom-ware is a kind of malware which prevents you from accessing the data you have stored on your computer. The malware ENCRYPTS (i.e. locks) ALL OF YOUR DOCUMENTS, EMAILS, PHOTOS, MUSIC – ANY data files you have on your computer, USB, External Hard Drive, and sometimes even your ENTIRE computer, programs and all (yes, this applies to servers, as well). Once it has infected the machine, it publishes a note of some sort forcing you to pay a ransom (thus, the ‘ransom-ware’ nomenclature) to get your data UNENCRYPTED (i.e. unlocked). (Wikipedia has a good description here). How do you get infected? Typically, Ransom-ware operates by YOU clicking on an ATTACHMENT from someone – even potentially someone you know. The attachments are typically disguised (i.e. named) as invoices, shipping information, or some other innocuous name. These guys/gals (the “baddies”) are GOOD at what they do. They masquerade as people you know (friends, family, business colleagues). Once the malware is on your computer, it can scrape your email addresses (yes, even if you don’t save contacts to an address book), then pretend to be you and send the infection on before locking down your system, so you can’t get to YOUR data. If you’re not expecting an invoice/shipping/whatever info from that person/business, do NOT open it. Call or email the person who sent it (using a clean, fresh email if you’re going to email) and ask them if they sent you an invoice or shipping documents or whatever. If they say ‘no’, DELETE, DELETE, DELETE!!!! Then, empty your trash can (i.e. deleted emails). If you DO get infected, then you have two choices: One, pay the ransom (and they’re NOT cheap – we heard of one organization paying tens of thousands of dollars to get the key to unlock their data). Two, recover from a backup that was done PRIOR to you clicking on the email attachment. The backup should NOT be connected to your computer via a cable, or it, too, may have been encrypted. Contact your computer support person/organization to find the best backup system for you…one that won’t be susceptible to this type of attack. Of course, your best protection against any type of attack is to use your head before opening ‘strange’ emails (even ‘strange’ emails from your friends) and having GOOD anti-virus/anti-malware software. You may not like paying for it, but it is critical in this day and age. Don’t be penny wise and pound foolish! A good anti-virus/anti-malware software will warn you before opening…of course, you can ignore the warning, but…well, we go back to using your head and THINKING!!! If you do that, you should be safe. Well, by now most of you have received some kind of pop-up window on your computer from Microsoft encouraging you to upgrade to Windows 10. A number of you have called or written asking if you should do it. My basic answer has been ‘I’d wait until you get a new computer’, as I’ve found that typically, operating systems operate better when they are ‘born’ on a particular machine (meaning that they shipped from the factory with that operating system installed), however, over the years, Microsoft has gotten better about upgrades actually working (what a concept), so my answer isn’t quite as adamant as it was a few years ago. I’ve hit the ‘ignore’ when prompted to upgrade my own machine (a less-than-one-year-old Windows 8.1 machine). When I arrived for a visit with my Uncle, I figured that he would ask me to do the upgrade (he always likes to have the ‘latest and greatest’). Imagine my surprise when I found out that he had ALREADY DONE IT!! Yeah, Uncle! And, according to him, it went flawlessly. If you choose to make the upgrade, make sure that you have PLENTY OF TIME – it takes about 3 hours to complete! My Uncle’s biggest complaint was that it took too long – not “too hard”, not “it didn’t work”, just “it took too long”. For those of you looking for ‘what does it look like’, here are a couple of shots from my Uncle’s computer (no, I didn’t rush and upgrade mine). If you click the ‘All Apps’ button (like the old ‘All Programs’ button under the traditional ‘Start’ menu), you get a more ‘traditional’ list of programs (which they now call ‘Apps’ – everything is an ‘App’). 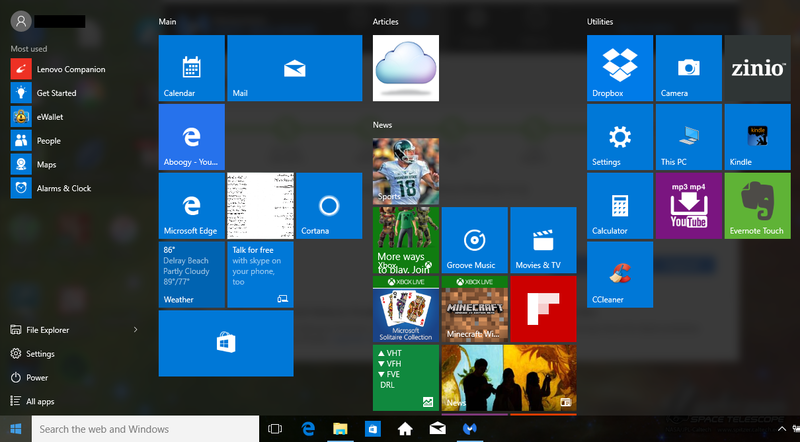 The Windows 8.1 Charm Bar is gone…the functions incorporated in various places (like the ‘Settings’ button that you see on the new ‘Start’ menu). Bottom line: As long as you have the TIME to upgrade, it’ll probably go OK. Just realize that my Uncle’s experience may not match yours – every computer configuration is different – even if they started out the same out of the box. One person’s experience does not guarantee your experience. BEFORE YOU TRY IT OUT, go to Google (or your favorite Search engine) and search for “is ‘insert the name of your critical program here without the apostrophes’ compatible with Windows 10” where you remove the ‘insert the name of your critical program here without the apostrophes’ and insert the name of YOUR program. That way, you know BEFORE you go through the upgrade if a critical program you use will have an issue or not (and whether there is a fix available). Do the same for your specific printer model (e.g. HP OfficeJet 8610) and any other ‘periferals’ (scanners, etc.) that you might have. 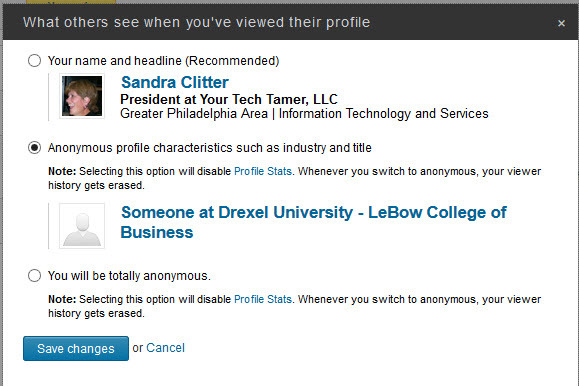 Do you hesitate to view a LinkedIn profile because that person will know you’ve checked it out? I don’t know about you, but this “Big Brother” world kind of creeps me out sometimes. I’m old school. I’m more used to privacy. Most weeks I’ll get an email from LinkedIn that says ‘Hey, check out the people who’ve viewed your profile’, and they show me THOSE PEOPLE’s profiles…plus, they try to get me to upgrade to LinkedIn Premium to get even more information. It took me a little while to realize this (not sure why…I just wasn’t thinking), but it suddenly dawned on me that if I can see that THEY viewed MY profile, then someone else can see that I viewed THEIR profile…and I may not want them to know that. One time, I even had someone call me after I looked at their profile saying, “I saw that you looked up my profile on LinkedIn, can we chat…”. That really creeped me out. I didn’t know the guy at all…I was checking out his profile because someone ELSE had asked me an opinion on his credentials. 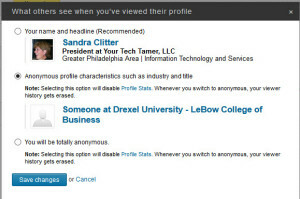 If I’m checking out a potential client, brushing up on who’s who before an important meeting (which you should ALWAYS do), checking out a potential employee’s profile, I don’t necessarily want them to know that I’ve been checking them out…so, I started thinking twice before checking out someone’s LinkedIn profile. Unfortunately, then I feel less prepared than I would have otherwise. 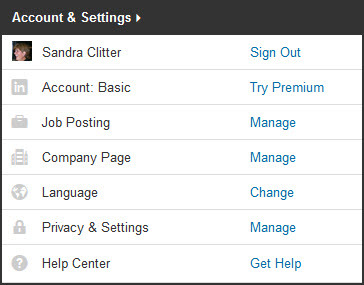 I was delighted when I found out about a Privacy Setting in LinkedIn that lets you adjust whether or not people get the details when you’ve checked out their profiles. YEAH!!! It’s an easy (if hidden) setting…check it out…it only takes a second to adjust…honestly. Second, click on your photo (it’s on the top-right side of the screen). That’s it. You’re done. You can view LinkedIn profiles without people knowing that you’ve done it (or at least without them getting too much information about you). I have a love/hate relationship with technology…as longtime readers of this blog know, I’m ‘of a certain age’…let’s just say that there were no such things as video games when I was a kid and be done with it. So, I’m a technology immigrant – technology landed in my world without asking my permission(! ), or asking if I needed it to be there…it just showed up…and, for the most part, it came with a Microsoft emblem blazing the way (that’s because I never did get the video game “thing”, so I can NEVER speak authoritatively, or even un-authoritatively, on video games). Then, there are quickstart guides to most of the Office applications – taking a glance at these, even for an experienced users, isn’t a bad idea…I already saw a thing or two that I’d forgotten. Then, hit CTRL+F (that means, hold down the “CTRL” key on your keyboard, then hit the “F” key while you’re holding down the CTRL key)…that will open up a search (find) screen. Enter in the word you’re searching for (e.g. Windows 8.1 or Excel) and hit ‘enter’…that will take you to the location of the first occurrence of the word/phrase you entered. See if that ebook can help. If it sounds interesting, click on the link under the image and download it. If that one doesn’t look like a match for you, hit enter again…the cursor will relocate to the next place those words appear. Rinse and repeat! Search away…and remember, don’t say that Microsoft isn’t trying (at least trying) to help you better understand their products! Happy hunting! Tell me your favorites once you’ve found them! UNTIL…you’ve been hacked. One of the most LIKELY TO GET HACKED paths you can take is to use Facebook as the login vehicle for other sites. Actually, I shouldn’t pick on Facebook…using ANY social media login to log in to other sites should be STRICTLY AVOIDED. Seriously. I can’t emphasize that enough. Why not? Well, it’s certainly easy, but it is also dangerous. Using your Social Media signon to access other sites is like using one password for ALL sites, but as Neil J. Rubenking of PC Magazine says, it is ‘worse, much worse’. Why would that be? Well, once you access your non-Facebook account via Facebook, you are, in essence, “connecting” the two, and allowing evil people to connect to all of your non-Facebook accounts with the ONE password they’ve stolen. In essence, you’ve given them the MASTER KEY to all of your accounts. Neil does a great job laying out this issue in a very short, but accurate article. Check out his article here: Signing into Websites with Facebook is Just Asking to be Hacked. Please, please…don’t do it. Hackers target the easiest and most bountiful companies for their time/effort…Those are not your local machine, but rather, the global websites and companies…Facebook is a PRIME target…don’t end up doing the ‘woulda, shoulda, coulda’ dance…just take the extra seconds to key in your username/password into the website…don’t fall into the easy, but very dangerous, ‘Use Facebook Login’. Please, I beg of you! There are a bunch of password management tools out there…and that does NOT mean an Excel/Word file stored on your computer called ‘passwords’! Use a password management tool…PC Mag also does a great review of those (Password Management Tool Comparison), but they don’t even list the one that I use which is ‘eWallet’ made by Ilium Software (eWallet)…I love e-Wallet because it syncs to my phone, so I always have all of my passwords with me. Just be double-darned sure that you’re using a VERY STRONG password on your password storage tool…and one that is TOTALLY DIFFERENT from any other password you use.